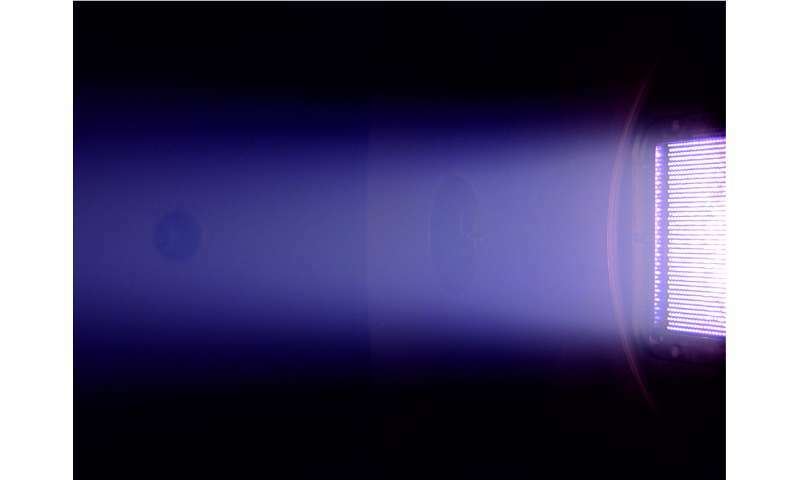 Plasma propulsion is an important and efficient technology used to control spacecraft for Earth observation, communications and fundamental exploration of outer space. Plasma propulsion systems use electric power to ionize propellant gas and transform it into the fourth state of matter, known as plasma. Electrically charged ions and electrons are accelerated in an exhaust beam to generate thrust and propel the spacecraft. The most established electric propulsion concepts, for example gridded-ion thrusters, accelerate and emit a larger number of positively charged particles than those with negative charge. To enable the spacecraft to remain charge-neutral, a "neutralizer" is used to inject electrons to exactly balance the positive ion charge in the exhaust beam. However, the neutralizer requires additional power from the spacecraft and increases the size and weight of the propulsion system. A team from the University of York and École Polytechnique is investigating how the neutralizer can be removed altogether. The researchers report their findings this week in the journal Physics of Plasmas. In 2014, Dmytro Rafalskyi and Ane Aanesland from the Laboratory of Plasma Physics, École Polytechnique, France demonstrated a new electric propulsion concept. The concept, called Neptune, leverages the technological heritage of gridded-ion thrusters. However, as comparable numbers of positively and negatively charged particles are present in the exhaust beam the neutralizer is no longer needed. To further develop the Neptune concept towards spaceflight, the researchers were interested in understanding how the plasma interacts with the acceleration system so that a charge-neutral beam is generated. They teamed up with James Dedrick and Andrew Gibson from the York Plasma Institute, University of York, U.K. to study how plasma behavior varies in relation to spatial location, time and particle energy. "The direct observation of how energetic plasma species behave on nanosecond timescales in the Neptune beam will help us to better control the processes that underpin neutralization," Dedrick said. As part of their investigation, the researchers studied the dynamics of negatively charged energetic electrons in the exhaust beam of the thruster and their behavior was observed to play a key role in beam neutralization. "We believe that this arises from a complex interaction between the plasma and acceleration grids, which is highly dependent upon the particle dynamics nearby to the grid surface," Dedrick said.